High-velocity fans are heavy-duty air-circulation floor fans that have a variety of uses- they can cool down your home, even replacing air conditioning. They're great for venting, cooling and drying out workshops and garages. Because they are fairly loud, some users even employ them as white noise machines- helping to drown out annoying noise while providing strong air circulation. The more powerful options include the MaxxAir with a CFM on its highest setting of 4,000. Some users find that they need to purchase more than one of these high-velocity air circulators in order to fully ventilate a large workshop, or truly replace air conditioning inside of a spacious residence. If you are in the market for a powerful air-circulating fan, understand that you will not receive an industrial-grade fan for clearance prices. So plan ahead, budget accordingly, and let's take a look at five of the best-selling high-velocity fans on the market today. 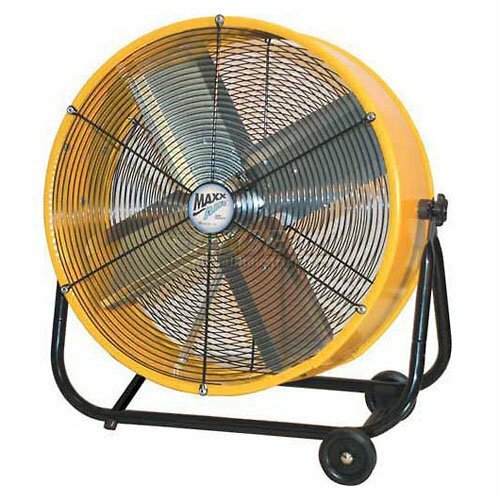 This Patton high-velocity fan is well-made, durable, and effective for keeping garages or workshops cool and well-aired. Users love that this heavy duty floor fan has a solid, metal construction, and it gets the air moving even on the lowest setting. However, some do note that it’s quite noisy. With a size of 7.2 x 20.9 x 20.9 inches, this floor blower fan has 3 speed settings, 18-inch metal blades, an adjustable head, a transport handle, a two prong plug, and a three-year warranty. It weighs 11.5 pounds so it seems like a good choice if you are looking for a powerful, but a low-cost fan. Users are happy with the performance, construction and the price of this industrial high-velocity fan. One user shares that it’s perfect for ventilating his home, and it’s easy to set it up and clean it with a damp cloth. Another user comments that this industrial fan is fast, large and vibration-free. He would recommend it to anyone who doesn’t want to use air–conditioning. A happy purchaser states that it’s great for the hot summer days since it produces a significant airflow, and the metal blades are more powerful than plastic ones. However, some users have complained that the motor gets very hot, and the heavy duty fan doesn’t move as much air as they would have liked. This high-velocity air circulator is powerful, well-built and a high-cost product that could be suitable for your workshop, home, patio or basement. Users love that it’s very easy to assemble and that it has wheels so they can easily move it wherever they want. However, some do note that this powerful air blower vibrates a lot when it’s turned on. Made from steel, this portable air circulator has a high CMF of 4000, a low CMF of 2800, a rust resisting grille, an 8-feet long power cord, and it weighs 35 pounds. As a whole, it looks like a high-quality product, useful for the hot summer days. Users are extremely satisfied with the performance, design, and durability of the MaxxAir heavy-duty fan. One user shared that he used it constantly for 48 hours, and it didn’t move an inch. The buyer says also that he can roll it around easily, and his only regret is that he didn’t buy it sooner. Another customer comments that this high CMF industrial fan circulates a large amount of air and that he mounted it on his wall without any problems. A happy buyer also shares that this high-velocity fan is not very noisy for the job it does, but he has problems with the wheels, which would often detach. Some other customers have complained that this heavy-duty air circulator arrived dented or that it “walked” while it was turned on. If you are looking for a cheap, but effective, high-velocity fan, you might want to take a look at the Royal Sovereign air circulator fan. Users love that it’s suitable not only for their home, but for the garage, workshop, and patio. It’s also easy to assemble since it doesn’t require any special tools, but some do note that they expected it to be more powerful. Made from plastic, this floor blower fan has a five wing blade, three-speed settings, an adjustable vertical angle, and a built-in handle. It weighs 9 pounds, and it seems like an effective air movement fan of average quality. Generally, users are pleased with the results they achieved with the Royal Sovereign air blower. One user shares that he is happy that he can move it around easily, and the airflow is good enough for him. He also states that even though the whole construction is plastic, it looks sturdy and works great. However, he notes that the blade’s balance is off and that may shorten the motor’s life. Another customer comments that the high-velocity blower is powerful, and he uses it without problems outside on his patio. Another purchaser says that it does a great job of cooling his garage. and he would gladly buy another one. However, one customer complains that it’s not powerful enough for him. 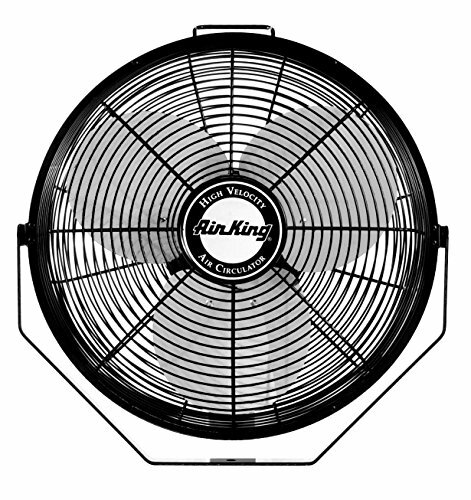 If you are on the lookout for a powerful, heavy-duty, high-velocity fan, you might want to consider the Air King fan. Users love that they can mount it on the wall, ceiling, or a steel beam to save space and to avoid tripping over the power cord. However, some do note that it might not work so great outdoors. With a 1-phase fully enclosed motor for quiet operation, this heavy-duty metal industrial fan has three speed settings for CMF up to 3190, and rotations per minute up to 1500. It has also a pivoting head, a rear mounted pull cord, a steel blade guard and a 9-foot, 3-conductor power cord. Overall, it looks like a very useful high-velocity air circulator, more suitable for industrial use. 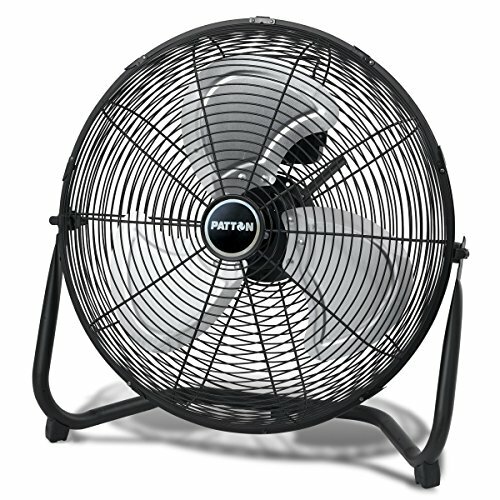 Generally, users are satisfied with this Air King industrial fan. One user shares that he can stand 15-20 ft. away from it and still feel the cool air and no vibration even on the highest setting. The buyer states that you can hear some noise, but for the amount of air that this wall mounted fan moves, the noise is manageable. Another customer comments that the industrial blower fan is well-balanced, quiets, runs smoothly, and you can use the bracket as a stand if you want to put it on the floor. A happy purchaser also shares that he is very impressed with the powerful motor and the fact that it works very quietly and won’t interfere with his conversations. However, some users have complained that it might not work well in a very hot climate or that it broke after a couple of months. This 2-in-1 portable heavy duty air circulator offered by MaxxAir is powerful, well-built and a high-cost product suitable for a variety of places. 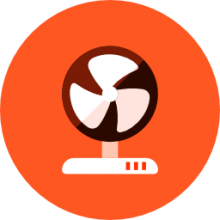 Users love that it could be used both as a floor fan and as a stand fan. However, some did note that it was poorly packed. With a size of 30 x 16 x 32 inches and a weight of 38.7 pounds, this portable air blower has a high CMF of 4000, a low CMF of 2800, a rust resisting grill, and eight feet power cord. Moreover, this floor/ stand fan with wheels has a 3.6-Amp motor, and it can tilt the airflow. Overall, it looks like a good choice, but with some performance issues. Generally, users have mixed opinions regarding the MaxxAir heavy-duty air movement fan. One user shares that the fan is great, but he finds it difficult to adjust the height since he has to un-assemble and re-assemble it every time. Another customer comments that it does a great job of cooling and ventilating his house, but it arrived with missing wheels. A very pleased purchaser also states that he cools off his 1600 square feet without problems with the high-velocity air circulator, and it works quietly so he definitely recommends it. However, many users complain that the air movement fan is very poorly packed without any protection, and as a result, they received a broken or damaged unit. When people are in the market for high-velocity industrial fans, they typically look to Home Depot, Lowes, Walmart or Target to find the student of high velocity and quality product they're looking for. If price is a consideration, or if you are looking for something cheap, it's a good idea to explore purchasing your heavy-duty fan online- there are a lot more options available at lower cost that you can examine than visiting your local hardware store or Home Depot. 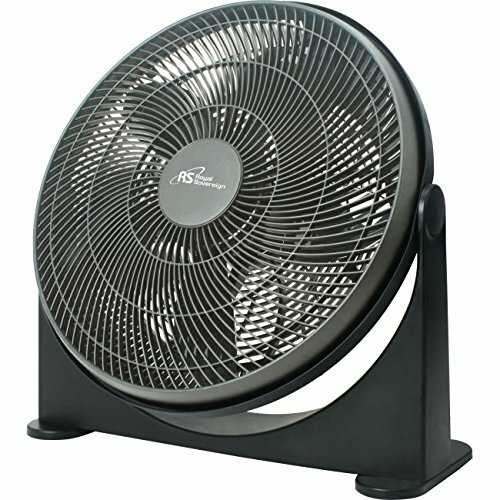 Some of the more common features that users look for when searching out a quality high-velocity fan is a tilt adjustable head, durable metal construction, carry handles that make it easy to transport, a rugged and durable motor, and metal fan blades that are designed to move air efficiently and effectively. These high-velocity fans are a great complement to a garage, workshop or basement- they are a little bit different, obviously, than their brother and sister fan units like stand fans, window fans, personal fans, tower fans as well as table fans. One of the more tried-and-true options available on the market today is the Patton high-velocity fan. It comes in 14", 18" and 20" variations and it features a rugged metal design that is ideal for extended and durable use. Users say that it's a great way to air out work areas- and one reviewer, in particular, said that it keeps the smoke alarm from going off when he is doing some garage work that creates some noxious fumes. Some other reviewers chimed in and said that while it is a little bit loud, this is expected, and importantly it is vibration-free. Other buyers said that, indeed, this is a very large fan unit with a cage that measures over 20 inches (if you purchase the 20" model), and the whole fan, when assembled, is over 10 inches deep. He also says that the power cord is around 5 feet long- and a tiny fuse is located in the 3 pronged plug, with an extra one included when purchased. Along with other buyers, he says that it does generate a lot of heat- and he also says that it is primarily engineered to be left alone in a single position, and not adjusted frequently. One important thing to note is that it doesn't tip it horizontally, though it does vertically. The Air King is an especially dynamic unit. Reviewers have been able to mount it on ceilings, I-beams and walls, which they say makes them useful in different settings that include restaurants, commercial plants, industrial spaces, as well as health clubs. One buyer installed three of these industrial fans in their barns- and he says that they get extended use, running for 24 hours a day throughout the spring and summer months. He shares a story of purchasing a cheaper box fan from Walmart and having the motor short out, which could've caused a devastating fire. He ended up going online and purchasing a more expensive air-circulating fan with a sealed motor, which is best practice in terms of fire prevention safety. Another reviewer says that they are great for business and personal use- they ended up installing them in a covered patio area, mounting them in the corners, and then hardwiring them to a switch so that they can be turned on in the sweltering summer months to provide cooling air. On the business end, he purchased five of these Air King models to install in his food production plant to keep his workers cool and the air moving inside of his factory. As we have seen, these high velocity, air circulating floor fans can serve a variety of purposes. Whether are you you are just trying to ventilate your workshop or garage work area, or just trying to drown out annoying noises with a little bit of air circulation thrown into boot, you can find a pretty inexpensive auction online to meet your needs. That said, if you are looking to purchase a true industrial fan, you may want to examine some different options to make sure you purchase one that has the strongest airflow available- what we have examined here represents a cross-section of quality high-velocity fans, but they may not be truly suited to extreme industrial applications.